Ábrete camino por encantadoras calles y callejones antiguos (hutongs) en un tour de 3 horas en rickshaw por Pekín. Súbete a tu modo de transporte tradicional y descubre un lado alternativo de Beijing; Conozca a los lugareños sobre la vida cotidiana y maravíllese con vistas espectaculares como Drum Tower. Visite una casa local para conocer las antiguas costumbres y cultura chinas y tome un té aromático recolectado de las plantaciones locales. Disfrute de la comodidad del transporte de ida y vuelta desde su hotel en este enriquecedor recorrido. Salga de su hotel en un cómodo vehículo con aire acondicionado y aventúrese hasta el magnífico tambor y el campanario, donde comienza el recorrido. Suba a bordo de su rickshaw, un método tradicional de transporte diseñado para transportar al conductor y los pasajeros, y comience a ver los lugares de interés de la ciudad. 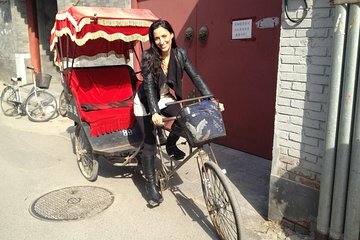 Sube al rickshaw y explora las viejas calles de Beijing; aprenda sobre las comunidades construidas alrededor de hutongs (calles estrechas) y luego llegue a un hogar chino local para conocer las costumbres tradicionales. Salude a la familia cortés y escuche a la gente local hablar sobre su forma de vida. Después de su enriquecedora experiencia cultural, diríjase a una casa de té tradicional para degustar las variedades de bebidas recién elaboradas en un ambiente ricamente decorado. Al final del recorrido, es posible que tenga la oportunidad de visitar la fábrica de seda dependiendo del interés. Regrese a su vehículo y relájese durante el viaje de regreso a su hotel, donde concluye el recorrido. Not much really to be seen or learned from the guide or the tour. You may be better off getting to the drum tower on your own. I was the only guest , it was a private tour with guide and driver!. a very interesting and insightful tour of the hutongs, or narrow alleys. watching folks go about their lives, and soaking up the culture. my guide was full of info, answered all my questions, and couldnt have been better. a very worthwhile tour, for sure ! Trip to the Bell/Drum towers was good. Not much of a rickshaw ride in Old Hutongs The demo of tea in one of the towers was nice but price to buy the teas was expensive. Then onto the silk shop which was interesting but again looking to sell expensive items to us. An interesting tour. My 7yo son asked to do this tour cos he wanted to ride in a rickshaw. It was really cold though. The visit to a home in the hutong was enlightening, and we also enjoyed the visit to the drum tower. Our guide, Gale, was excellent. She was punctual in picking us up at our hotel, very knowledgeable about history, and spoke good English. Had an amazing guide, Gale. She gave very detailed explanation. However, I realised she didn't take me to the Prince Gong's Mansion as stated in the tour details. was a little disappointed. I was probably expecting something different. A dedicated private tour for two with a driver and an a very nice English speaking lady guide.